Today the beneficiaries were in huge numbers and they have to wait hours together at the DC office to get their turn. 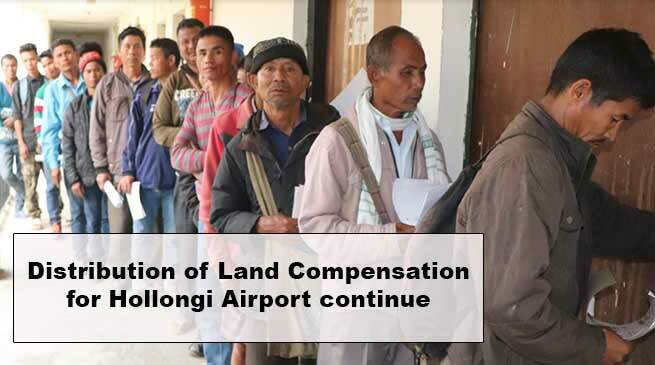 The distribution of land compensation for construction of Green field Airport at Hollongi and Relief and Rehabilitation package continue on fourth day at the office of the Deputy Commissioner. Today the maximum beneficiaries were from Chakma family who were in large numbers and come to attend the hearing process who were summoned by the district administration. Many beneficiaries was seen upset on the rate of the compensation. Talking to media few ladies said that ‘though we are parting with our dwelling and other asset but we are not properly informed about our resettlement and wanted to know as if there is another process of it’. It is to mentioned that the land owners were invited on batch wise so that there are no disturbance in the court. However today the beneficiaries were in huge numbers and they have to wait hours together at the DC office to get their turn. The sources inform that the members was awarded whose name was found in the Rehabilitation and resettlement plan for their standing assets. In the first batch a total 135 land owners were called on Feb 1. The second batch were from 136 to 199 on Feb 2. The third batch were called on Sunday who were 41 beneficiaries while rest more than 150 Chakma settlers are summoned today for the compensation in fourth batch.